It’s #WombmanWednesday over on our Instagram and there’s no better day to talk about having a happy womb. Usually I spend Wednesdays shouting out phenomenal women and sharing a womb health tips. But what good is all that if the majority my sistas are stressed, upset and wondering “how?” when it comes to getting healthy and happy from the inside out. I’m only 27, what do I know about womb health? I’m sure I don’t know it all. What I do know is that about a year before I had my first son, I was rocked with the worst menstrual cramps. IN. Life. My whole life was a hot mess and I was miserable. I was allowing myself to be stuck in a toxic relationship, I was constantly stressed and I pretty much felt hopeless. You can safely say I did not have a happy womb. At that time I was given the diagnosis that many young women are getting, the big bad endometriosis. A resident doctor told me I’d never have children. I was devastated. It’s crazy how they throw those kinds of words around like they’re God…but I digress. I decided that I would have children no matter what the doctors said, so I knew it was time to change my life. The diagnosis could’ve very well been true, but I’ve always been a stubborn gal. So I chose not to believe it and began my journey to a healthy, happy womb. It wasn’t easy and it was definitely more spiritual than I expected it to be. But you know what? It was worth it. Here I am, almost 7 years later, 3 babies deep, and much more clear, focused and aware… but still on the healing path. I’ve realized that womb work is ongoing. As long as we have wombs, they’ll need to be maintained, like anything else. Are you ready to get happy from the inside out? Eat like you love yourself! I know how hard it is to say no to those fries….”it’s just ONE…” but know that every bite you take is either fueling wellness or sickness. Nearly 80% of American women will be affected by fibroids before their 50th birthday. That’s a scary statistic. I know that I’ve been affected and nearly every woman I know has too. Greasy foods, refined sugar, and other chemical ingredients push us further down the road to womb sickness. Eating habits that tell your body “I love you” can go a long way toward creating whole, happy wombs. Adding more fruit and veggies is a no brainer, but also how we eat can make a big difference. Overindulging, eating on the go and not taking the time to sit and savor cause harmful chemical reactions in our bodies. So take some time to sit …and breathe. Try using healthy sugar alternatives like agave nectar and honey to have sweets without the harmful affects. Also, consider cooking with rich olive and avocado oils instead of GMO laced vegetable oil. You’ve been through a lot. As women, we’ve been through a lot. What most of us don’t know is that all those unprocessed emotions we swallow go right to our wombs. It’s a holding chamber for our dreams, goals, and traumas that are waiting to be processed. You may not notice but, whatever you’ve gone through, you survived! Give yourself credit for that. Never beat yourself up for the paths you’ve taken. We all make some ratchet choices at some point. Did you learn the lesson? Good! Look yourself in the mirror and tell her how much you appreciate her for just surviving it all. For being strong even in your weakness and growing through it. There’s a woman inside of you waiting for gentle words, from you. Check out one of our Essence of Womanhood videos if you need more encouragement. There’s nothing like a like minded network of sisters who are rooting for your wellbeing! It’s a beautiful feeling to be on the journey to healing and happiness with women who just “get it”. I know, Bitter Betty might have been your friend since Pre-K but, if she’s not trying to grow with you, you gotta let her go girl! My grandma always told me that white can never stain dirt, but dirt will always stain white. So get around women who uplift you, encourage you and hold you accountable for being a happy black woman! It’s so hard for me to sit still sometimes. There’s so much to do and what seems like no time to do it. When I’m running in circles, that’s when I know I need to sit still the most. Our wombs are our creative center. 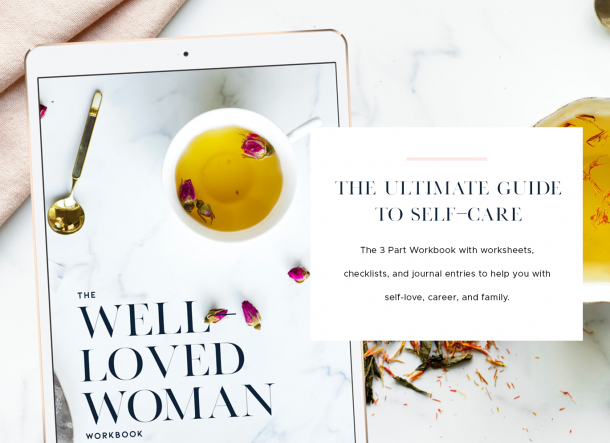 Taking time to sit and reconnect with our center is important for every woman who wants to create. Allow yourself 10-15 minutes a day to sit and detox from all the drama, hurt and disappointment you may be feeling. Take time to think loving thoughts and send positive healing energy to your most sacred space and everything around you will take on a new sense of serenity and clarity. We are literally surrounded by healing…all.the.time. This earth is full of an abundance of herbs and medicinal plants that promote healthy wombs, mental wellness and even beat depression. Science has proven that the American diet doesn’t come close to having all the minerals we need to promote optimal health. I’ve been lucky enough to stock my medicine cabinet with herbs that help not only supplement my diet but also help me to heal myself from the inside out. There are many herbs that help to balance our hormones, tone our reproductive organs and lift our moods. Don’t have time to mix your own herbs? I made a blend just for us! You can get it here. Learning to identify and use the wild herbs in your area can make all the difference. We’re always sooooo busy! Too busy for ourselves really. We’re grinding, “goal-getting” and doing a hundred other things – like putting our selves on the back burner. Let me let you in a little secret. Everything will get done. The kids will eat, your husband will too! Relax for a minute. Clearly God knew the importance of rest because He mandated a whole day of the week to do just that. We have to know that our bodies are not built to just go and go without stopping at some point to recharge. You charge your phone don’t you? Well, love your body like you love your phone. I’m big on “earthing”. I’ll stretch out in the grass in a hot second. Reconnecting with nature is KEY! I’m tired of hearing it too. And it is easier said than done. But holding on to grudges,”what she said” and “what he did” is not hurting them, it’s killing YOU! I’ve told you how our wombs are our bodies holding tanks. So all those things you’re inwardly mad about are just sitting there, festering. Creating stress, which creates cortisol, which creates sickness. Yep, those spiritual and emotional wounds will create real life, physical illness if you don’t send that stuff to the left. Write it out, say it out loud, scream it if you have to. Just get it out of your system and let it stay gone forever. Allow yourself to smile. Often. It won’t hurt you, I promise. I heard that all the time when I was pregnant. Small but mighty, your pelvic floor muscles hold up everything in your upper body. Exercise them things! Prolapse (when the muscles collapse) is becoming way too common and it’s really avoidable. Kegels are an easy exercise that you’re probably already doing and don’t even realize it. But now you can do them intentionally. Basically you squeeze your pelvic floor as if you’re “holding it” when you have to go to the restroom. Sounds simple but it does wonders for revitalizing the yoni and strengthening your core. So are you ready to commit to stepping boldly into a space of health and happiness? What are some ways you show your womb you care? 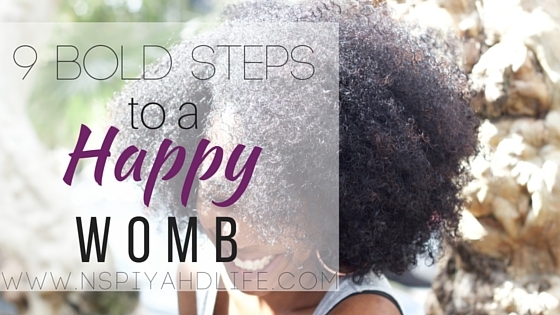 This post is great, simple instructions on how to be a healthy happy woman. Thank you for sharing your story and these tips.